Our family was given bags of fresh broccoli, so I needed to come up with some new meals for that broccoli, and my son absolutely loves Cheesy Broccoli and Rice so I decided to make a soup and do it in the Crock-Pot. 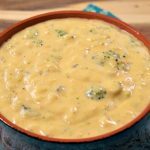 I have previously made a Three Cheese Broccoli Soup that was SO delicious, but this time I didn’t have the various cheeses on hand and wanted to simplify the meal, so I went with an easier “cheese”. It worked amazingly well and the only time consuming part is cutting up the broccoli. You can also use frozen broccoli that you have thawed, but you will want to trim the stems off. If you have some leftover cooked chicken you can add some cubed or shredded chicken to the soup to up the protein factor. But as is, this recipe is awesome! This would also be a great base recipe to add any leftover veggies you may have floating around in your refrigerator. It is a very flexible recipe, so to experiment! Saute the diced onion in the butter in a small frying pan on the stove top until the onion has turned translucent. While the onion is cooking wash and trim the broccoli heads, trimming off as much of the woody stem as possible. 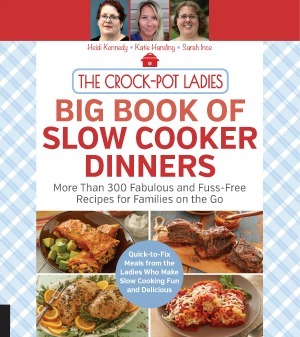 Line a 6.5 quart slow cooker with a slow cooker liner (optional but makes clean up easier). 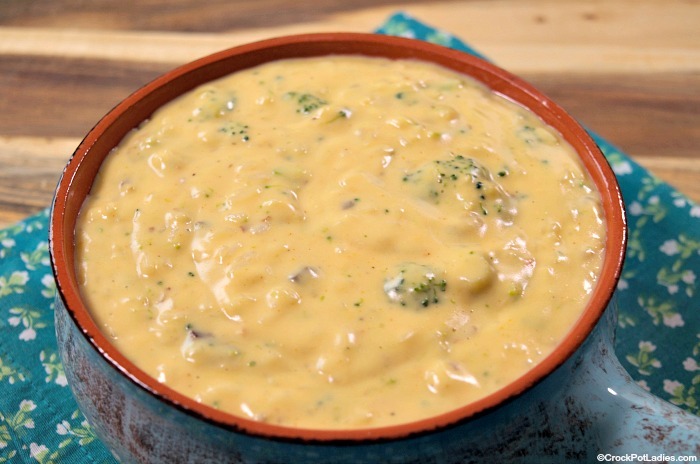 Pour in the condensed cheddar cheese soup, cream of celery soup and then add your broccoli florets. Add the evaporated milk, onions and spices and stir everything together well. Cover and cook on LOW to 3 to 4 hours stirring at least once in the middle of the cooking time. 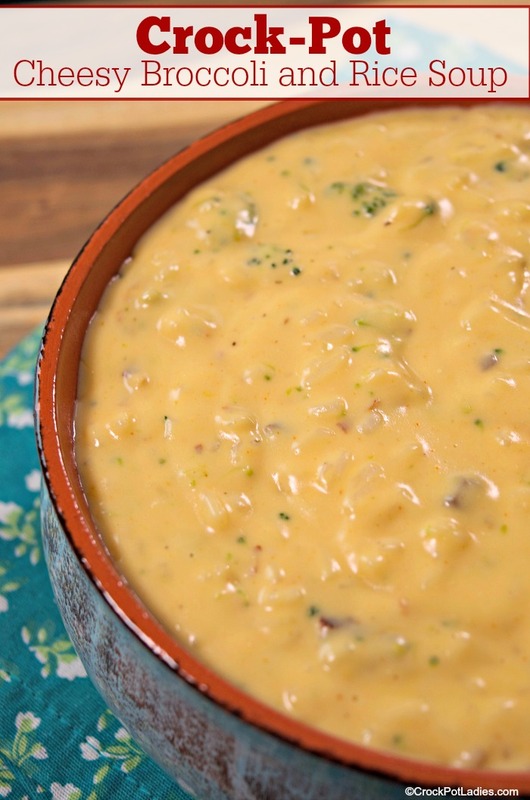 During the last 20 minutes of cooking, add the cooked rice and shredded cheese to the crock-pot and stir everything together and cook for 20 minutes to give the cheese some time to melt into the soup. Serve in bowls with crusty bread to dip into your soup and enjoy!